"We see clear winners for the next 25 years - natural gas but especially wind and solar - replacing the champion of the previous 25 years, coal. But there is no single story about the future of global energy: in practice, government policies will determine where we go from here." What are the key routes for large, complex multinationals to meet their combined energy and sustainability needs? What — after all this debate over climate, the price of energy, and competing in a carbon- and capital-constrained world — would lead to clearly defining energy competitiveness? What mix provides a reliable, tested set of actions and investments? 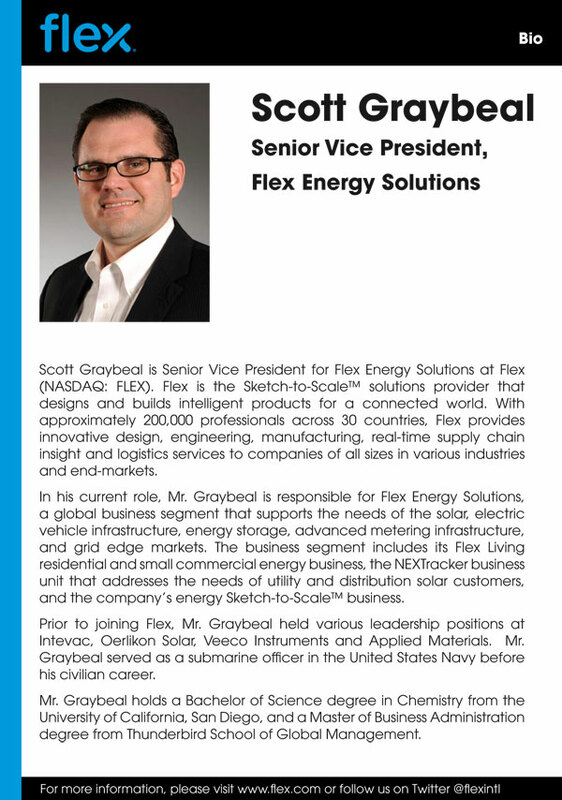 To show the range of Flex's reach and Graybeal's skills, we attach Scott's bio below (the other speakers’ bios are included in the workshop agenda). These are two of the ten market-shaping executives maturing the leading edge of energy competitiveness. They will give you a reliable insight into what is now happening, and where the technology and markets are heading. Many of you know that the US Air Force — as our workshop Chairman Ken Strassner puts it — "is well ahead of large parts of the private sector, and they offer us the leading model in organizations on energy innovation." Flex is working with over a thousand corporate customers globally to extend the reach of what they can do in alternative energy at scale, from Microsoft and Wal-Mart to Mars and others present in November. 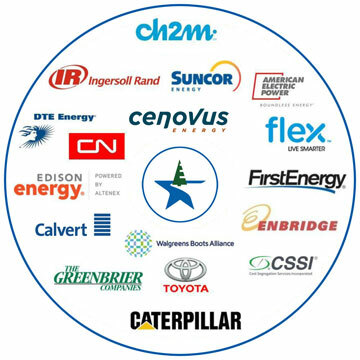 The seventeen sponsor organizations displayed here, along with the speakers listed below, include some of the largest energy users and innovators in the world. They support this ongoing Energy and Sustainability working group at $20,000 per year. The price for you as a non-member for this single November workshop is $2,695. We credit that fee toward membership should you wish to remain involved in an ongoing way. For further details regarding either workshop registration or program sponsorship, please contact Marti Simmons (marti@ahcgroup.com) to schedule a call. Suddenly, in the last three or four years, such a menu of options in energy has become of sustained concern at the senior management and Board level of the hundreds of firms we have served since 1981. Much of this is market-driven, combining strategy, innovation, brand, investor relations, and other parts of leadership councils. 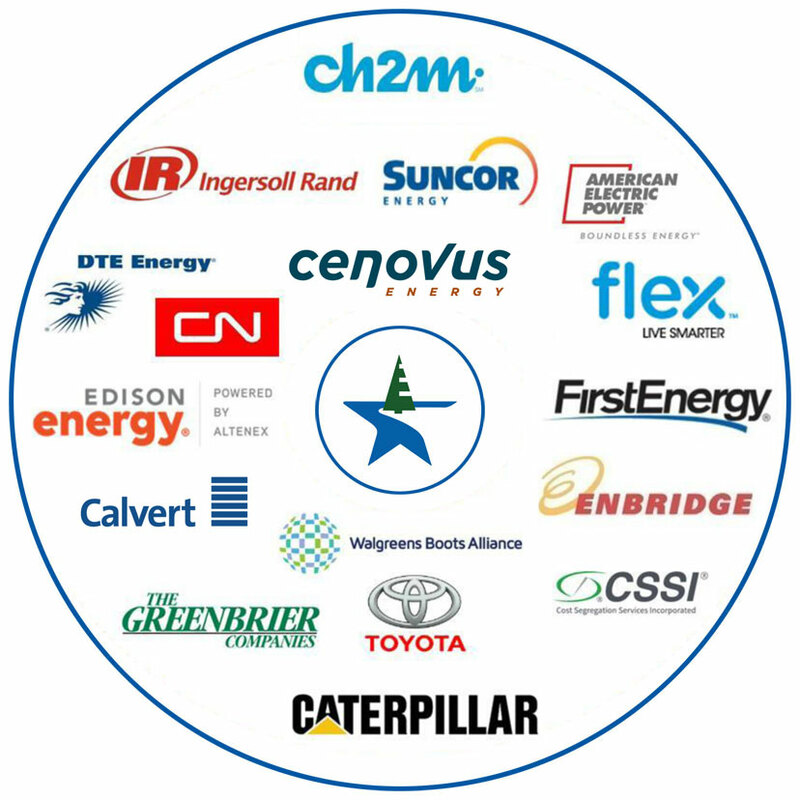 To examine this menu of market-driven strategic options, we now have organized a 40-firm Business-to-Business best-practice summit, to be hosted by our corporate affiliate Ingersoll Rand at their North Carolina headquarters. For the past four years, the AHC Group has sponsored a series of special workshops focused on Energy Innovation and Carbon Competitiveness. We invite you to attend the ninth workshop in this series. Edison Energy, a leading provider of strategic energy planning services to major corporations. Enbridge, the largest energy infrastructure player in Canada and the U.S.
Caterpillar, a leader in onsite energy generation and storage solutions. CH2M, a leading global engineering firm whose work enhances the energy efficiency and security of the U.S. Air Force, with an Air Force leader in co-presentation. Renewable Energy Buyers Alliance, the recently formed advisory group helping companies learn how to purchase renewable energy effectively. Besides these speakers, there will be several panels with new world companies like Flex, Apple, Microsoft, and other members of the RE100 reporting on their commitments, decisions, and steps planned forward. Over a focused day and a half, this meeting is designed to give attendees practical and strategic guidance that they can take back to their leadership councils in a format of use. AHC Group workshops are actively facilitated, and designed for interaction between the large sponsors, speakers, and invited leaders. They are held under Chatham house rules in a private sanctuary that is ongoing. Additional information on the workshop may be obtained from Bruce Piasecki, President and Founder of the AHC Group, at bruce@ahcgroup.com. 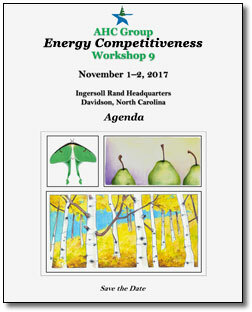 For more on the history of our eight prior sessions, please contact our workshop chair, Ken Strassner (ken@ahcgroup.com), formerly from Kimberly Clark, where he made these types of energy decisions. Registration and hotel information is available from AHC's Corporate Affiliates Director, Marti Simmons, at marti@ahcgroup.com.